(Newser) – With the body count mounting in Syria, Bill Clinton has joined the chorus calling for American intervention, in what some are seeing as a sharp turn away from the White House. At a closed-to-the-press event on Tuesday night, Clinton sided with John McCain—the Obama administration's biggest critic on Syria policy—in saying the US was being too cautious. "Some people say 'OK, see what a big mess it is? Stay out!' I think it's a big mistake. 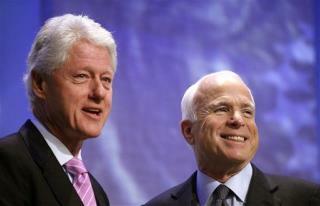 I agree with you about this," he can be heard telling McCain in a recording of the event obtained by Politico. Further, if a president did nothing because "80% of (the public was) against it ... you'd look like a total wuss," said Clinton. "Clinton said, likening the situation more to Ronald Reagan's Afghan intervention " At least he was honest about this part, but what did Reagan do in Afghanistan? He gave billions for the founding of Al Qaeda. At least we know where some or all the WMD went. We as a country have learned nothing sense 1945. What happens when you give one child candy ( gun's ) and not the other. One wants more and the other one hates you, and you lose the respect of both. When my children fought I told them I would punish both and the punishment would be so severe that they would not want to fight. I only had to do this once and they settled there differences between themselves peaceable. If we are going to be the police of the world let them know we have a big stick and will use it or stay the hell out. Of course the Obama administration can send troops over to Syria without catching flack from the leftists in this country. Who is to say the weapons sent to arm the rebels won't end up in the hands of the Syrian rulers? Would those weapons then be used against American soldiers? But why be concerned since at least he isn't George W. Bush, the hated president.